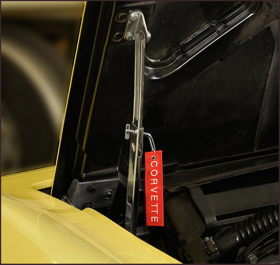 The Latch Pin will safely secure the Corvette hood when in an open position for engine display, viewing or engine service and maintenance. Prevents accidental hood release from wind or an unintentional bump that can result in a costly repair or injury. The chrome plated 9/32” hardened steel latch pin can be positioned and secured through the existing hole in the hood support with only one hand.